Ford of Europe’s vision for electrification includes 16 vehicle models — eight of which will be on the road by the end of this year — the company announced at its Go Further event in Amsterdam. Those plans include a plug-in hybrid variant of its Kuga SUV, its Mustang-inspired crossover, and a commercial transit van. Ford’s European electrification strategy is in line with its plans for North America to focus largely on hybrids. For instance, in a separate event on Tuesday Ford took the wraps off its latest generation of the Escape, a 2020 model vehicle for the North American market that is sportier, loaded with technology and, comes with hybrid and electric options. Last year, Ford ramped up its plans, announcing that it would phase out most cars it sells in North America. Ford will continue to produce the Mustang and focus the rest of its efforts in North America on trucks, utilities and commercial vehicles, as well as a move into electric vehicles. The operational piece of Ford of Europe’s strategy, which does include a couple of all-electric vehicles in the mix, namely the Mustang-eseque SUV, will be largely led by Stuart Rowley. Rowley, who took over as vice present and president of the regional outfit on April 1, will be responsible for all operational leadership of the business unit, including acceleration of the European transformation strategy. He reports to Jim Farley, president of Ford Global Markets. 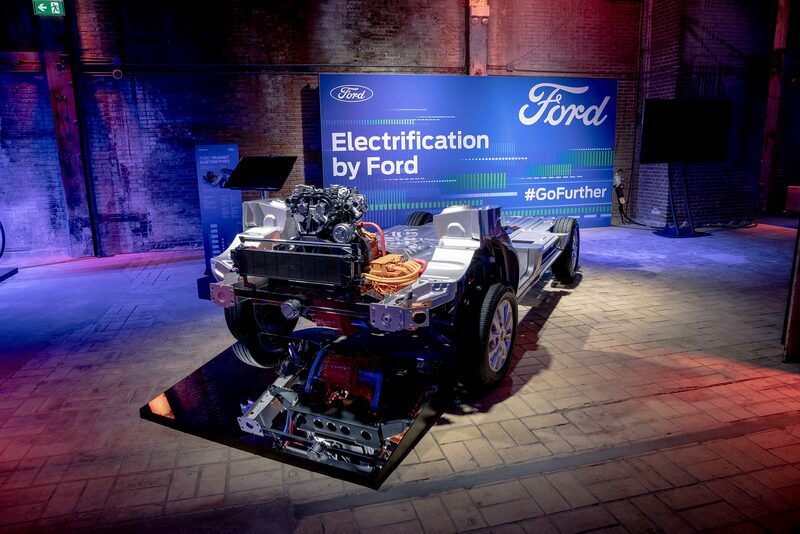 The majority of the vehicles introduced Tuesday at Ford of Europe’s event are either hybrid or plug-in hybrid vehicles. Two of those vehicles – a plug-in hybrid Explorer SUV and a new plug-in hybrid Tourneo for the commercial van market – made their global debuts at the Go Further event. A plug-in hybrid variant of Ford’s new mid-size Kuga SUV, which will have a 31-mile range for the battery piece of the hybrid picture, was also introduced along with new Fiesta EcoBoost Hybrid and Focus EcoBoost Hybrid models that feature mild-hybrid technology for optimized fuel-efficiency. Ford focused on the commercial end of the market as well, with plans to bring an all-electric Transit van to Europe by 2021. Ford is bringing a plug-in hybrid version of the Transit van to market this year. This plug-in hybrid will have a 13.6 kWh lithium-ion battery pack and Ford’s 1-liter EcoBoost gas engine, which acts as a range extender. The powertrain will have an all-electric (sometimes referred to as a zero-emission driving range) of 31 miles, and a total 310 miles range using the range extender. The vehicle is being trialed in London, with further testing scheduled to start soon in Valencia, Spain, and Cologne, Germany. The Ford of Europe event confirmed that the often-teased ‘Mustang-inspired’ electric crossover will be more than a North American market. The vehicle, Ford said Tuesday, will be able to travel 600 kilometers, or 370 miles, on a single charge when it comes to market in 2020, an estimate based on European fuel consumption and emissions standard known as WLTP. The WLTP, or World Harmonised Light Vehicle Test Procedure, is a new standard that is supposed to make European fuel economy labels more realistic. (In the past, ranges in Europe were wildly overstated compared to the more conservative EPA estimates. Vehicles in the U.S. use EPA estimates. Ford has said it’s targeting a 300-mile range for its electric crossover in the United States.